Although Logic began as music notation software, its Score Editor has recently been overshadowed – outpaced even – by its other features; and outshone by the richer feature set of the dedicated music notation software, Sibelius. We’ve looked previously at Johannes Prischl’s excellent book covering the Score Editor. 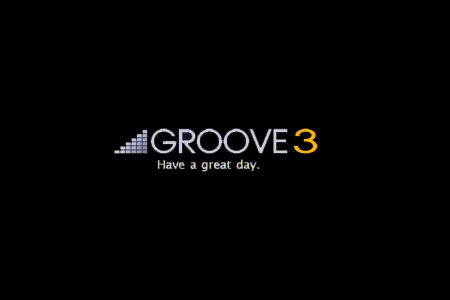 Now Groove 3 has released an equally useful, well-structured and expertly-written and presented set of nearly 60 video tutorials on the subject. As usual, you can access these videos, which represent more than five hours of instruction by Apple Certified Logic Trainer, Doug Zangar, both online and as downloadable units in a zip file of over 710 MB in size. They’re arranged in 15 categories reflecting the target audience and its likely progression from beginner to intermediate user. The first thing you’re likely to be struck by is Doug Zangar’s clear, authoritative yet approachable manner and style in delivering material with which he’s obviously extremely familiar and about which re-assuringly knowledgeable. Not to mention understandably enthusiastic, for Logic‘s Score Editor is indeed very powerful. In keeping with the other Groove 3 videos that we’ve looked at, there’s a professional air to the presentations. Faux fumbling (to make the student feel at home, you understand!) has no place here. Rather, we’re guided at a brisk pace – but one we can keep up with – through the basic concepts, variations in use and some of the less obvious concepts and ways to make the most of Logic‘s Cinderella module. And yet without a hint of slickness. At the same time, when a detour is needed, such as setting Preferences to alter a default behavior, it’s achieved swiftly and simply. By the same token, when something is postponed – some slightly more obscure configuration, for example – and it’s promised for later, it always does re-appear; and at a time that makes as much sense then as it made at the time merely to refer to and “bookmark” it for later use now. Again, this adds to your sense of being in really good hands. Zangar is also well-versed enough in the way real people really use the Score Editor to anticipate misunderstandings, puzzles or misconceptions and correct and help with them – the facts that the Score Editor only works on MIDI files; and that few of the annotations such as hairpins can actually affect the sound played back, for instance. If a point needs re-iterating (the good sense of working with different ScreenSets, making duplicates, for instance), Zangar makes no apologies for repeating it. He also throws in the kind of seasoned user’s (and trainer’s) tips – such as making sure that you have actually selected the correct paper for printing; and setting “Bar Offset” only at the end of your work – that a drier, perhaps more linear, manual might miss. Almost as helpful is his toned-down shepherding through some of Logic‘s quirks – screen redrawing, for example – and assurances that there’s always another way to do something; and his calm assistance with weighing what do and don’t need to be worried about and what accepted as unimportant or unlikely to impede your priority, of making music. There’s a certain spontaneity to Zangar’s narrative style as he works his way through his material that’s compelling; it builds confidence. The same – paradoxically – can be said for the conversational delivery (but not too much so) into which the presenter slips quite often; when he asks, for instance, “Will Reset do the same thing here?” it’s not because he’s underprepared. Far from it. The very latitude he gives himself as he seems at times to be almost experimenting as things appear to occur to him along the way serves actually to reinforce our acceptance and appreciation that he is totally at home with everything he’s doing and implicitly commending to us the relative weights that should be given to the steps he’s demonstrating. Logic‘s Score Editor is complex; when you remember that it’s also part of an extremely complex Digital Audio Workstation (DAW), the intricacies, interdependencies and involvements of one set of systems and interactions with another are literally infinite. Hence the importance of having a clear objective (or several limited, known objectives) for each tutorial. Hence, too, the importance of planned progression through the material and topics. And hence the need methodically to cross-reference. These are all handled well. Some videos are split sensibly into two parts. Most last under ten minutes. Just the right length to explore a theme or topic without feeling overwhelmed. The topics covered in the 58 sessions (that’s just 68 cents each) include: getting started, and overview of the Score Editor’s window; editing; the menus to deal with score layout, functions, attributes, and text; the View menu; creating a lead sheet; parts; creating an orchestral score template; drums; polyphonic staff style; printing and guitar tabs and chords. It’s probably for effective use of the Score Editor more than in any area of Logic that a good grounding in music theory is beneficial… notating grouped time signatures, the relationships between Major and minor, enharmonic naming for example. Obviously Zangar is more than qualified here too. At the same time, those areas of the Score Editor which need the most attention and explanation from this point of view, such as functions, attributes, parts etc, generally get them. It is necessary for us users to have basic (or perhaps a little better than basic) familiarity with the rest of Logic – at least with navigating through the relevant parts of it, its structure, and the concepts which underly such things as context-sensitive menus, the relation of Global tracks to the rest of your work, the various ways that tools can be configured and used. Otherwise you’re likely to need to spend time following those (easy though that comes to be in time) rather than understanding every last feature of the Score Editor itself. If you’re not yet completely comfortable with the way Logic does what it does, then you probably won’t get the most from this series – even though you might want to start your work in music by scoring as opposed to recording. You’d be advised to start with one of Groove3’s other, more basic, Logic tutorials and come back here once you’ve got to know the wider context in which you’re working. Conclusion: Logic Score Editor Explained is a well-priced, expertly designed and presented set of tutorials that will more than meet the needs of even quite advanced users of this part of the excellent Logic DAW.